At 1-800-Flowers.com's retail shop at its Carle Place headquarters, staffers spend some of their busiest days of their year filling holiday orders for customers. Daisy Chin has not spent Valentine's Day with her husband in 18 years. But Chin, a longtime employee at the 1-800-Flowers.com shop on the first floor of the company's headquarters in Carle Place, said if she did, she'd miss the excitement of watching shoppers scramble through the door at the last minute, trying to snag the perfect gift for their significant others. "Plus, he completely understands it's a fulfilling job for me, and anyway, you know, we celebrate it every day, Valentine's Day," she said with a smile, as she put together a whimsical floral arrangement: a puppy made of white carnations holding a small bouquet of dark purple mini-mums. "This is a 'designer's choice,' " a creation that was not ordered by a customer, she said. "I just love working on arrangements like this one because I know it will bring a smile to someone's face." 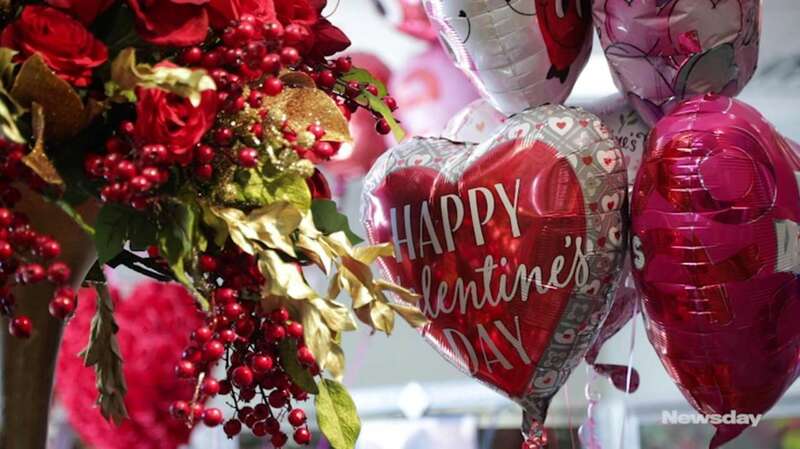 To be sure, the days leading up to Valentine's Day are some of the busiest of the year at the store — the holiday is second only to Mother's Day in terms of spending on flowers, the company said. This week, Chin and her colleagues are starting their days at 7 a.m. and working until 8 p.m. or later, she said. "It really depends on whether customers are still walking in," Chin said. "Because we don't turn anyone away, so if we see them coming, we won't shut the door on them." Alfred Palomares, vice president of merchandising for consumer floral at 1-800-flowers.com, said planning for Valentine's Day is a top priority for the company. "As soon as it's over, we're planning for the following year. It's a continuous business," he said. "And in the days leading up to Valentine's Day, we're really working around the clock. It's an all-hands-on-deck situation with people prepping, cleaning, dethorning, and just making sure every arrangement is picture-perfect." 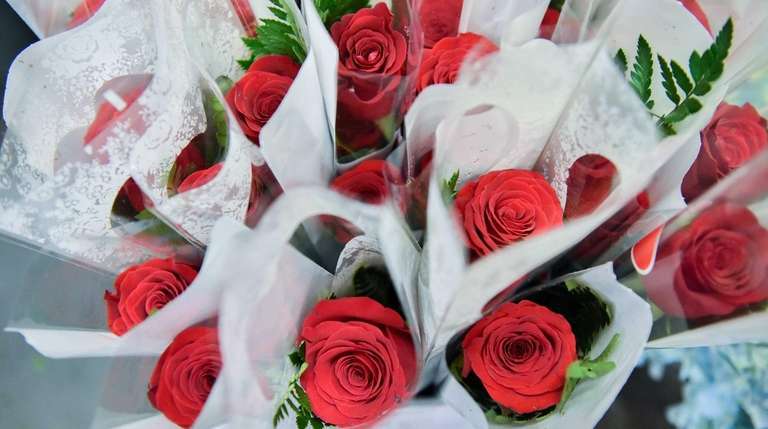 This year, fewer consumers planned to buy Valentine's Day gifts, but those who did planned to spend more — and not just on romantic partners, according to a survey by the Washington, D.C.-based National Retail Federation. Those surveyed said they would spend an average $161.96, up 13 percent from last year's $143.56 and topping 2016's record $146.84. "There's a big increase this year in consumers spreading the love to children, parents, friends and co-workers," NRF president and CEO Matthey Shay said. "Those who are participating are spending more than ever . . . With employment growing, consumers appear to be expanding the scope of who qualifies for a card or a box of candy." 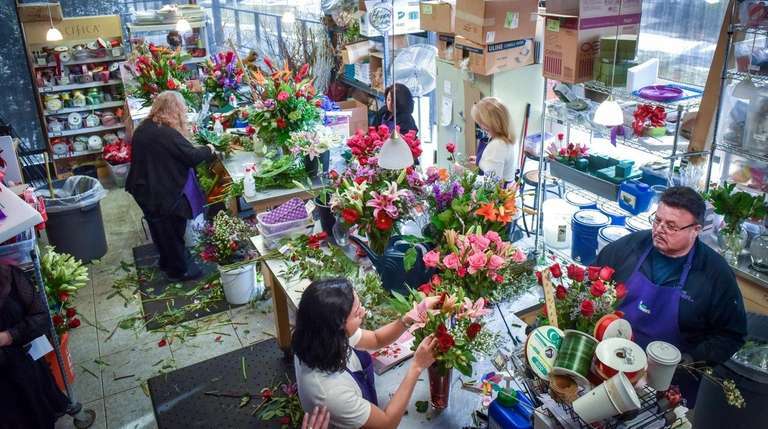 Palomares says 1-800-Flowers expects to sell about 17 million flowers this V-Day, including 10 million roses — all of which need to be dethorned by employees like Philip DeVito, a 15-year veteran at the shop. "Once in a while you'll get 'thorn bit,' meaning you get a cut on your hand from a rose thorn," said DeVito, as he removed the thorns from a bunch of red roses, a process that he said takes him "a quarter of a second." "But once you've been doing this for a while, you know what not to touch. And if you get cut, it's OK. The day after Valentine's Day feels like a half day."